Dharam Singh (Born 15 Feb 1936) is a Nihang theologian, writer and preacher, known for exegesis and expositions of Adi Granth and Dasam Granth. Enrolled as Nihang in Budha Dal, he worked as a secretary and participated in various religious conventions. 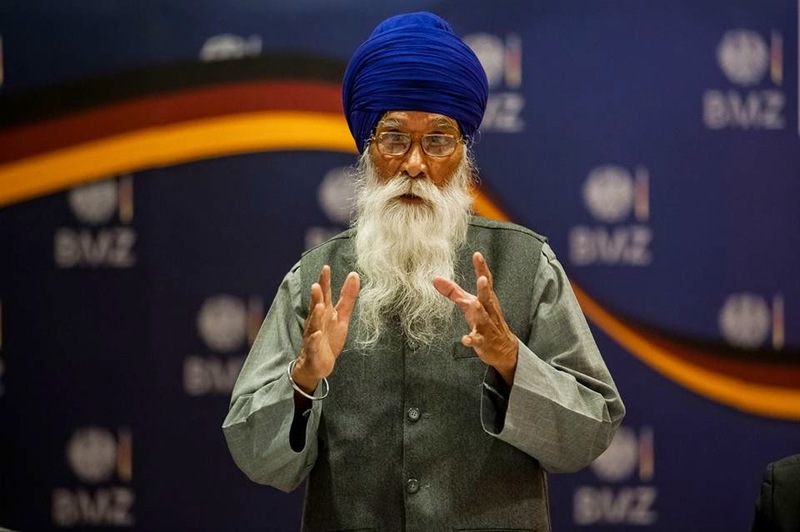 He contributed the view of Sikh Religion on Human Rights in German Book, Menschenrechte im Weltkontext. In February 2015, he was the very first speaker of the dialogue series entitled Religion Matters established by the German Federal Ministry of Economic Cooperation and Development (BMZ). On letter call from SGPC, he had written various articles in response to Gurbaksh Singh Kala Afghana, who spoke against Amrit and Dasam Granth. He started Sachkhoj Academy which provides platform for independent researchers of Gurbani to perform unbiased research , and learning to use the Adi Granth dictionary lexical resource for the exegesis. This Website has been created to spread the real message of Gurbani with help from Nihang Dharam Singh of SachKhoj Academy. This website is different in the sense that all the interpretations of Gurbani done till now are based on the worldly meanings whereas Gurbani contains teachings which are Omnipresent and Omniscient.